This article is about linguistics. For the rhetorical concept, see Circumlocution. In linguistics, periphrasis (/pəˈrɪfrəsɪs/) is the usage of multiple separate words to carry the meaning of prefixes, suffixes or verbs, among other things, where either would be possible. Technically, it is a device where grammatical meaning is expressed by one or more free morphemes (typically one or more function words accompanying a content word), instead of by inflectional affixes or derivation. Periphrastic forms are an example of analytic language, whereas the absence of periphrasis is a characteristic of synthetic language. While periphrasis concerns all categories of syntax, it is most visible with verb catenae. The verb catenae of English are highly periphrastic. The light verb constructions are periphrastic because the light verbs (give, take, have) have little semantic content. They contribute mainly functional meaning. 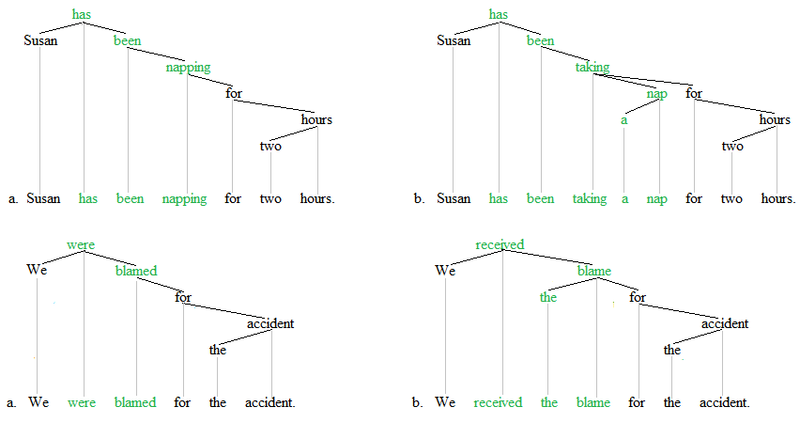 The main semantic content of these light verb constructions lies with the noun phrase. Periphrasis is a characteristic of analytic languages, which tend to avoid inflection. Even strongly inflected synthetic languages sometimes make use of periphrasis to fill out an inflectional paradigm that is missing certain forms. A comparison of some Latin forms of the verb dūcere 'lead' with their English translations illustrates further that English uses periphrasis in many instances where Latin uses inflection. English often needs two or three verbs to express the same meaning that Latin expresses with a single verb. Latin is a relatively synthetic language; it expresses grammatical meaning using inflection, whereas the verb system of English, a Germanic language, is relatively analytic; it uses auxiliary verbs to express functional meaning. (2) נתן מבט ‘’natán mabát’’ “looked” (which literally means “gave a look”) AND העיף מבט ‘’heíf mabát’’ “looked” (literally “flew/threw a look”; cf. the English expressions ‘’cast a glance’’, ‘’threw a look’’ and ‘’tossed a glance’’) vis-à-vis the Hebrew-descent הביט ‘’hibít’’ “looked at”. (3) the colloquial expression כאפן א קוק ‘’khapņ a kuk’’, which literally means “to catch a look”. הרביץ ארוחה ‘’hirbíts arukhá’’ “ate a big meal” (ארוחה ‘’arukhá’’ meaning “meal”), cf. English ‘’hit the buffet’’ “eat a lot at the buffet”; ‘’hit the liquor/bottle’’ “drink alcohol”. The Israeli Hebrew periphrasis דפק הופעה ‘’dafák hofaá’’, which literally means “hit an appearance”, actually means “dressed smartly”. The correspondence in meaning across inflected forms and their periphrastic equivalents within the same language or across different languages leads to a basic question. Individual words are always constituents, but their periphrastic equivalents are often NOT constituents. Given this mismatch in syntactic form, one can pose the following questions: how should the form-meaning correspondence across periphrastic and non-periphrastic forms be understood? ; how does it come to pass that a specific meaning bearing unit can be a constituent in one case but in another case, it is a combination of words that does not qualify as a constituent? An answer to this question that has recently come to light is expressed in terms of the catena unit, as implied above. The periphrastic word combinations are catenae even when they are not constituents, and individual words are also catenae. The form-meaning correspondence is therefore consistent. A given inflected one-word catena corresponds to a periphrastic multiple-word catena. The role of catenae for the theory of periphrasis is illustrated with the trees that follow. The first example is across French and English. Future tense/time in French is often constructed with an inflected form, whereas English typically employs a periphrastic form, e.g. Each time, the catena in green is the matrix predicate. Each of these predicates is a periphrastic form insofar at least one function word is present. The b-predicates are, however, more periphrastic than the a-predicates since they contain more words. The closely similar meaning of these predicates across the a- and b-variants is accommodated in terms of catenae, since each predicate is a catena. ^ "periphrasis | Definition of periphrasis in English by Oxford Dictionaries". Oxford Dictionaries | English. Retrieved 2018-02-01. ^ Concerning periphrasis in general, see Matthews (1991:11f., 236-238). ^ Concerning the competing forms of the comparative and superlative in English as an illustration of periphrasis, see Matthews (1981:55). ^ Concerning the use of periphrasis in strongly inflected languages, see Stump (1998). ^ See p. 51 in Zuckermann, Ghil'ad (2009), "Hybridity versus Revivability: Multiple Causation, Forms and Patterns", Journal of Language Contact, Varia 2, pp. 40-67. ^ Concerning catenae, see Osborne and Groß (2012a) and Osborne et al (2012b). Matthews, P. 1991. Morphology, 2nd edition. Cambridge, UK: Cambridge University Press. Osborne, T. and T. Groß 2012a. Constructions are catenae: Construction Grammar meets Dependency Grammar. Cognitive Linguistics 23, 1, 163-214. Osborne, T., M. Putnam, and T. Groß 2012b. Catenae: Introducing a novel unit of syntactic analysis. Syntax 15, 4, 354-396. Stump, G. 1998. Inflection. In A. Spencer and A. M. Zwicky (eds. ), The handbook of morphology. Oxford: Blackwell. pp. 13–43.